In the previous article, the Alternative Code Binding and Alternative XAML Binding pages featured a Label with its Scale property bound to the Value property of a Slider. Because the Slider initial value is 0, this caused the Scale property of the Label to be set to 0 rather than 1, and the Label disappeared. At first, this might seem backwards: Now the Label is the data-binding source, and the Slider is the target. The binding references the Opacity property of the Label, which has a default value of 1. But you might be surprised that the Slider continues to work, as the Android and UWP screenshots demonstrate. This seems to suggest that the data binding works better when the Slider is the binding target rather than the Label because the initialization works like we might expect. The difference between the Reverse Binding sample and the earlier samples involves the binding mode. Every bindable property has a default binding mode that is set when the bindable property is created, and which is available from the DefaultBindingMode property of the BindableProperty object. This default binding mode indicates the mode in effect when that property is a data-binding target. The default binding mode for most properties such as Rotation, Scale, and Opacity is OneWay. When these properties are data-binding targets, then the target property is set from the source. However, the default binding mode for the Value property of Slider is TwoWay. This means that when the Value property is a data-binding target, then the target is set from the source (as usual) but the source is also set from the target. This is what allows the Slider to be set from the initial Opacity value. This two-way binding might seem to create an infinite loop, but that doesn't happen. Bindable properties do not signal a property change unless the property actually changes. This prevents an infinite loop. When data bindings are used with the Model-View-ViewModel (MVVM) application architecture, the ViewModel class is the data-binding source, and the View, which consists of views such as Slider, are data-binding targets. 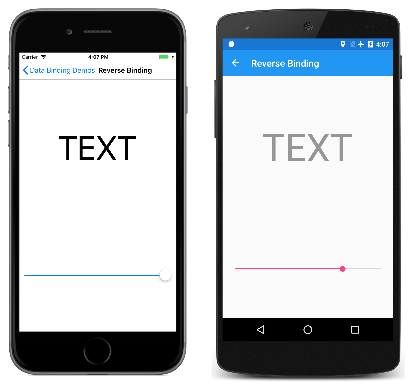 MVVM bindings resemble the Reverse Binding sample more than the bindings in the previous samples. It is very likely that you want each view on the page to be initialized with the value of the corresponding property in the ViewModel, but changes in the view should also affect the ViewModel property. The properties with default binding modes of TwoWay are those properties most likely to be used in MVVM scenarios. The rationale is that a binding on the SelectedItem property should result in setting the binding source. An example later in this article overrides that behavior. Several properties have a default binding mode of OneTime, including the IsTextPredictionEnabled property of Entry. Target properties with a binding mode of OneTime are updated only when the binding context changes. For bindings on these target properties, this simplifies the binding infrastructure because it is not necessary to monitor changes in the source properties. 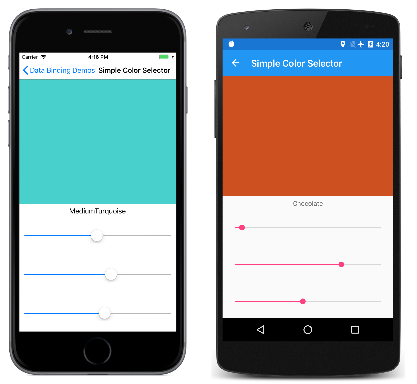 The Simple Color Selector page demonstrates the use of a simple ViewModel. 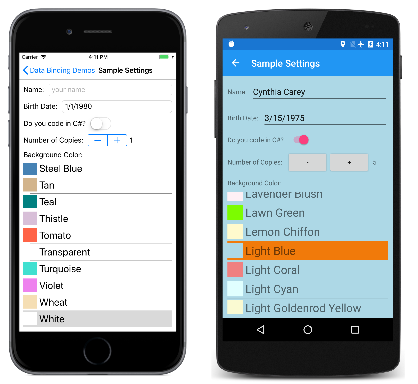 Data bindings allow the user to select a color using three Slider elements for the hue, saturation, and luminosity. When the Color property changes, the static GetNearestColorName method in the NamedColor class (also included in the DataBindingDemos solution) obtains the closest named color and sets the Name property. This Name property has a private set accessor, so it cannot be set from outside the class. When a ViewModel is set as a binding source, the binding infrastructure attaches a handler to the PropertyChanged event. In this way, the binding can be notified of changes to the properties, and can then set the target properties from the changed values. However, when a target property (or the Binding definition on a target property) has a BindingMode of OneTime, it is not necessary for the binding infrastructure to attach a handler on the PropertyChanged event. The target property is updated only when the BindingContext changes and not when the source property itself changes. The BoxView, Label, and three Slider views inherit the binding context from the Grid. These views are all binding targets that reference source properties in the ViewModel. For the Color property of the BoxView, and the Text property of the Label, the data bindings are OneWay: The properties in the view are set from the properties in the ViewModel. The Value property of the Slider, however, is TwoWay. This allows each Slider to be set from the ViewModel, and also for the ViewModel to be set from each Slider. As you manipulate the sliders, the BoxView and Label are updated accordingly, as illustrated by the Android and UWP screenshots. The binding context can be set in a variety of ways. Sometimes, the code-behind file instantiates the ViewModel and sets it to the BindingContext property of the page. These are all valid approaches. If the default binding mode on the target property is not suitable for a particular data binding, it's possible to override it by setting the Mode property of Binding (or the Mode property of the Binding markup extension) to one of the members of the BindingMode enumeration. It might be expected that the Slider would be initialized to the initial value of the Scale property, which is 1, but that doesn't happen. When a TwoWay binding is initialized, the target is set from the source first, which means that the Scale property is set to the Slider default value of 0. When the TwoWay binding is set on the Slider, then the Slider is initially set from the source. Now the Slider is initialized to 1 (the default value of Scale) but manipulating the Slider doesn't affect the Scale property, so this is not very useful. The VisualElement class also defines ScaleX and ScaleY properties, which can scale the VisualElement differently in the horizontal and vertical directions. A very useful application of overriding the default binding mode with TwoWay involves the SelectedItem property of ListView. The default binding mode is OneWayToSource. When a data binding is set on the SelectedItem property to reference a source property in a ViewModel, then that source property is set from the ListView selection. However, in some circumstances, you might also want the ListView to be initialized from the ViewModel. Each application setting is a property that is saved to the Xamarin.Forms properties dictionary in a method named SaveState and loaded from that dictionary in the constructor. Towards the bottom of the class are two methods that help streamline ViewModels and make them less prone to errors. The OnPropertyChanged method at the bottom has an optional parameter that is set to the calling property. This avoids spelling errors when specifying the name of the property as a string. The SetProperty method in the class does even more: It compares the value that is being set to the property with the value stored as a field, and only calls OnPropertyChanged when the two values are not equal. The SampleSettingsViewModel class defines two properties for the background color: The BackgroundNamedColor property is of type NamedColor, which is a class also included in the DataBindingDemos solution. The BackgroundColor property is of type Color, and is obtained from the Color property of the NamedColor object. // Loop through the public static fields of the Color structure. // Convert the name to a friendly name. // Instantiate a NamedColor object. For more information on the application lifecycle methods, see the article App Lifecycle. <Label Text="Do you code in C#? " <Label Text="Number of Copies: "
All the children of the page inherit the binding context. Most of the other bindings on this page are to properties in SampleSettingsViewModel. The BackgroundColor property is used to set the BackgroundColor property of the StackLayout, and the Entry, DatePicker, Switch, and Stepper properties are all bound to other properties in the ViewModel. The ItemsSource property of the ListView is set to the static NamedColor.All property. This fills the ListView with all the NamedColor instances. For each item in the ListView, the binding context for the item is set to a NamedColor object. The BoxView and Label in the ViewCell are bound to properties in NamedColor. The default binding mode for SelectedItem is OneWayToSource, which sets the ViewModel property from the selected item. The TwoWay mode allows the SelectedItem to be initialized from the ViewModel. The other two screenshots show altered settings. When experimenting with this page, remember to put the program to sleep or to terminate it on the device or emulator that it's running. Terminating the program from the Visual Studio debugger will not cause the OnSleep override in the App class to be called. In the next article you'll see how to specify String Formatting of data bindings that are set on the Text property of Label.